ZylGPSReceiverAX 3.12 - Download Win Apps. ActiveX control that communicates with a serial GPS receiver. 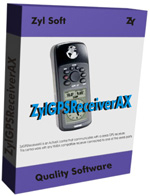 ZGA is an an award-winning ActiveX control that communicates with a serial GPS receiver. You can use it also with USB devices, because these devices usually have a driver that redirects the input from the USB port to a virtual serial port.